Some sophisticated traders with automated programs are using computer algorithms that instantly capture Trump’s Twitter remarks and then immediately buy or sell the affected stocks, analysts say. The jaw-dropping speed at which certain stocks have moved in response to Donald Trump’s tweets about corporate America makes it seem as if Wall Street already was waiting for the president-elect’s words. Some sophisticated traders with automated programs are using computer algorithms that instantly capture Trump’s Twitter remarks then immediately buy or sell the affected stocks, analysts said. “It’s in the algorithms. They’ve done it,” said Joe Gits, chief executive of Social Market Analytics. Gits’ firm isn’t among those traders, he said. Instead, the company culls the 500 million tweets issued daily on Twitter to find comments from influential people such as Trump that could affect stocks and then immediately relays that “sentiment” data to traders. Wall Street is tight-lipped about which firms use the automatic trading programs in their bid to profit from Trump’s tweets, and it’s unclear how much of the stocks’ trading volume reflects the automated trades. Representatives from venerable investment firms such as Goldman Sachs Group, Morgan Stanley and Bank of America’s Merrill Lynch all declined to comment. So did Citadel Securities, a well-known automated trading firm that also operates a hedge fund. Gits likewise said he was not at liberty to disclose the names of traders using such automated programs. The secrecy isn’t surprising because firms employing the programs, which try to profit from even modest point spreads on high-volume trades, don’t want to reveal their advantage, said Josh Brown, chief executive of Ritholtz Wealth Management who also runs the Reformed Broker website. For average investors, the instant post-Trump market moves can largely be ignored, analysts said. That’s because the stocks that have quickly dropped in response to Trump soon bounce back, a trend that’s likely to continue, they said. “If you’re a day trader, you want to know about it, but if you’re the average 401(k) investor, it doesn’t make any difference in the long run,” Gits said. 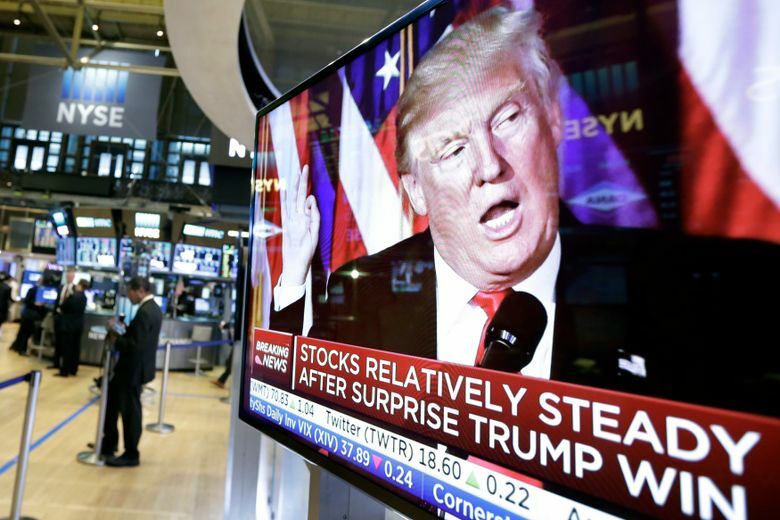 Nonetheless, there’s surging interest even among investors who don’t rapidly trade stocks to be immediately notified when a new Trump tweet appears. At Bloomberg — a major provider of market data and news, with about 325,000 of its computer terminals used by traders and others worldwide — Trump tweet notifications are “one of the fastest-growing alerts for a news product that we have ever launched,” said Ted Merz, Bloomberg’s global head of news product. There also are new phone apps from firms such as Trigger Finance and IFTTT that quickly alert users if Trump tweets about any companies in which they own stock. Trump, who will be sworn into office Friday, is a prolific Twitter user who in recent weeks has taken to the social media platform to criticize corporate giants such as defense firms Lockheed Martin and Boeing and automakers Ford, General Motors and Toyota. Trump attacked the defense firms for the high costs of certain aerospace programs, and he railed against the car companies for building vehicles in Mexico that are sold in the U.S. In each case, the companies’ stocks dropped immediately after Trump’s comments appeared on his Twitter feed. “The almost instantaneous movement in stock prices following some Trump tweets, most notably for Toyota, suggest to us that traders are using algorithms that execute trades immediately,” Merz said. Trump jumped on Toyota on Jan. 5, tweeting his displeasure that the company plans to build Corolla cars for U.S. sale at a new plant in Mexico. Toyota’s U.S.-traded shares quickly fell nearly 1 percent, wiping $2 billion from Toyota’s total market value, then soon recovered some of those losses. The software and algorithms that enable Wall Street’s high-speed traders to respond automatically to Trump’s outbursts weren’t developed specifically in the aftermath of Trump’s defeat of Hillary Clinton on Nov. 8, analysts said. “It’s been around for a time predating Trump,” Brown said. He pointed to how past tweets by Clinton, billionaire investor Carl Icahn and Tesla Motors Chief Executive Elon Musk, among others, have sparked immediate moves in stocks of companies they mentioned. Clinton, for instance, sent biotech stocks tumbling in September 2015 after she tweeted about wanting to lower “outrageous” prices in the specialty drug market. So how do Trump’s tweets and Wall Street’s immediate response affect investors who don’t watch the market every hour? CNBC markets analyst Jim Cramer said on his TheStreet.com website that “if you decide to make a strategy on (Trump’s) tweets, you better make it a buy strategy — because (Trump’s criticism) clearly hasn’t had any lasting effect” on stocks he mentions. He cited billionaire Warren Buffett, who’s famous for holding solid investments for years.